The Guild prides itself in providing an unrivalled recruitment service for publications, businesses and organisations looking to employ some of the UK's top agricultural communicators. We do this by highlighting job vacancies direct to our 450+ members involved in journalism, photography, commercial PR and marketing communications. Charged at just £175 each, this service comprises a dedicated Jobs eAlert email and a reference highlighting the vacancy in a monthly general eAlert – both with a link to a pdf document giving details of the organisation and the vacancy in question. The advertisement is also displayed on the Guild website until the application closing date and the vacancy is announced via the Guild's Twitter and Facebook accounts. This service provides Guild Members with all the latest information about current job vacancies – and how to apply – at their fingertips. To use the service, contact Peter Hill. One past user of the service says: "Several of the better quality applicants responded to the Guild's e-Alert; we have successfully appointed someone and he is a Guild Member. We had small numbers in terms of responses to our recruitment ad from all sources, but it is quality that counts. "We would certainly use the Guild again for future appointments advertising, as it is so well targeted for our needs." Nine high quality tenders were submitted to the IAgrE for its house magazine contract, six of them as a result of circulating the tender document via the Guild's eAlert service. The contract was subsequently awarded to a Guild Member. Chris Whetnall of IAgrE comments: "It was a very useful exercise that resulted in substantial transparency of process, added credibility to the tendering process and left me feeling that, having attracted a wide spread of submissions, I had done a good job." 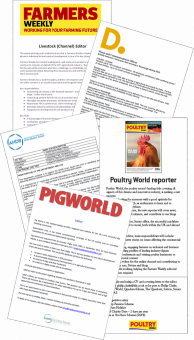 The AgriScot event used the Guild eAlert service to help recruit a new PR and marketing agency. Bill Romanis, of the organising committee, said: "We didn't expect a big response, and didn't get one, but those we did hear from were of the highest calibre, so the exercise was most certainly worthwhile." Mark Simpson of Young & Country wrote: "From reading comments on the Guild website from previous advertisers we were not expecting a large response but we expected those who did respond to be of a very high calibre. That is precisely what we got. We could not happier with the result and are very much looking forward to working with the journalists who contacted us. "For the price of the advert, we feel it is tremendous value for money."